The dark half of the year begins on Samhain’s night and symbolizes the end of summer. 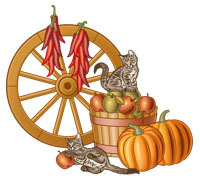 Samhain is the magical New Year, and the third and last harvest festival in the pagan Wheel of the Year. Samhain is usually celebrated on October 31st, but some traditions prefer November 1st. It is considered the most favorite Sabbat amongst many pagans. This is a time of a magical interval, when the regular laws of time and space are temporarily suspended, and the thin veil between two worlds is lifted. Communication with ancestors and the dead is easy on Samhain, when they travel through this world on the way to the land of eternal summer. It may seem strange that the New Year begins in autumn, when the days get shorter and colder. However, death and birth are two sides of the same coin. This is a time death as well as a time for new beginnings, when we think about hope and change. The Feast of the Dead (another name for Samhain) was originally celebrated in Celtic countries by leaving a sacrificial meal on altars and doorsteps for the “walking dead”. Candles were lit inside the house as a source of light that showed the spirits the way. Additional items and objects were placed on tables inside the house for the unseen guests. Apples were buried along roadsides to point the way to the lost spirits. Turnips hollowed out and were carved to look like spirits that protect the house during the night. People dressed in white clothes that reminded of ghosts, and it was advised to leave the house after dark. Some of these traditions are still carried out to this day. Samhain was the last celebration before the arrival of winter. Our ancestors were under threat of survival during unusual severe winters or late springs, as they had no way to predict the season’s weather and temperature. They had to rely on rebirth of nature, and their myths and stories reflect this period of instability and unrest. The hope and the promise of reincarnation (of themselves, as well as nature) was the only thing that kept them going at such times of physical uncertainty. Traditionally, Samhain is the harvest festival of meat, as there was a time when cattle and other animals were slaughtered for food during the hungry winter months. Other names for Samhain: Halloween, Third Harvest, Feast of the Dead, All Hallow’s Eve, Witch’s New Year, Samuin. Symbolism: Third harvest, dark mysteries, rebirth through death. Symbols: Pumpkins, apples, black cats, scarecrow, broom. Food: Turnips, apples, pumpkins, nuts, wine and meat. Colors: Black, orange, white, silver, gold. Stones: All black stones, preferably hematite and obsidian. Animals: jackal, cat, bat, scorpion, crows, deer, jack, sparrow, heron. Incense & oils: Cedar, copal, willow, eucalyptus, frankincense, heather, mugwort, myrrh, patchouli, peppermint, sage, sandalwood. Decorations: Autumn leaves, autumn flowers, pomegranates, apples, pumpkins, corn ears, grain sprouts, corn dolls, nuts, seeds, pumpkin gourds. Your Wiccan altar can be covered with black or orange cloth on Samhain. Place photos of beloved people who are deceased on your altar, as well as other things that remind you of them. Items and decorations such as pumpkins, pomegranates and grain sprouts can be placed as well. Samhain shows the Goddess as an old lady. The old lady teaches us wisdom the helps us to release of the old, and change and grow instead. Getting older means losing something, but it also means gaining something. The old lady teaches us that letting go of old is a natural part of life. When we let go of old things, we prepare a place for something new. If someone is dying, he frees up place for a birth of a new person. When we let go of a year passed by, we welcome the birth of a new year to come. The time between Samhain and Yule Sabbat (Winter Solstice) is a time of waiting, as waiting for the formation of a baby inside of a woman’s womb. We still don’t know what the new year will bring, but we can dream and plan. It is a time to get closer to the Goddess by visiting the elders such as your grandparents or neighbors. The God in Samhain is the Horned God, the deer whose horns are fully grown. In ancient times, people’s lives depended on hunting, and the Horned God was the God of hunt, represented by an animal that sacrificed its live to feed us. The Horned God reminds us that our lives are a gift given to us by other creatures. Food is a gift of life and is sacred. We treat food with respect. Most Pagans believe that communication with the dead is risky. People do this only when absolutely necessary. Some spirits come into our world as guardians and mentors, while others may be aggressive-minded. Spirits need to move freely and the best we can do for them is leave them alone. Death is a transition, which means moving from one reality to another. Samhain is one of the few exceptions to this rule, but even at this time it is not recommended to communicate with the souls who do not wish to be disturbed. At this time, we invite those whom we remember to join our celebration, should they choose so, but we never force them to do so. There are many different Wiccan ways to celebrate Samhain, some like to work with witchcraft by performing rituals and casting spells, some like to open tarot spreads for themselves, while others like to cook festive dishes.